Thursday, December 6th is ISLA’s next late start. Buses and school will start 2 hours late. If you need child care for this day, please contact Aventuras at Aventuras@isla-academy.org. They need at least 24 hours to process requests for care. Looking for a way to help support the mission and oversight of our amazing school? ISLA needs you! We are looking for interested community members, teachers, and parents to fill several upcoming vacancies on the ISLA Board for three-year terms, beginning June 30, 2019. No previous experience necessary, but we do have a specific need for expertise in finance/accounting. The Board is responsible for overseeing the general operations of the school, implementing policies and procedures, and long-term strategic and financial planning. There are a number of different committees on which Board members can serve. Click here for descriptions of the various committees. Questions can be directed to Mary Jo De Villers, Election and Nominating Committee Chair, at mdevillers@isla-academy.org. If you are interested in applying, please submit a Statement of Interest to the Election and Nominating Committee. Click here for Statement of Interest. The election for office will occur in connection with the annual meeting May 21, 2019. We’re always looking for future LA Host Families. Please contact Kim Gelperin (kimgelp@gmail.com) or Meggin Gregory (gregorymeggin@gmail.com) for more information. On Tuesday the Minnesota Center for Book Arts served as the perfect creative backdrop for ISLA 6th graders to explore their creativity. Students have spent the last 5 weeks digging deep into the concept of conflict as they unpack their central idea: In times of conflict, art allows for introspection and can serve to promote action for peace. Through the process of paper cutting and collaged paper each student created their own multi-toned print design that will be used as propaganda for promoting action on a global issue that matters to them. These provocative posters will be exhibited at our end-of-year celebration of learning called the Exhibition. 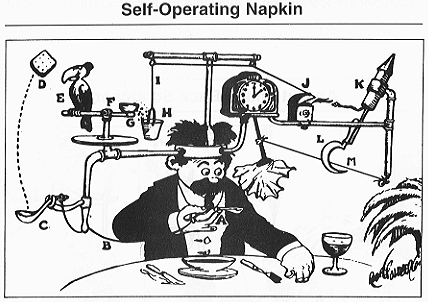 A Rube Goldberg is an overly designed contraption with a series of steps to accomplish a simple task. ISLA students. Students will work in teams (2-8 people per team).Up to 4 teams per grade level. All teams must have a parent sponsor. There will be a parent information meeting for parents interested in sponsoring a team on Monday,December 17 at 6:30. A training workshop will be provided in January to assist the teams with tips and ideas to help the team with the Rube Goldberg.